Malibu is a beach city in Los Angeles County, California, situated 30mi west of Downtown Los Angeles. 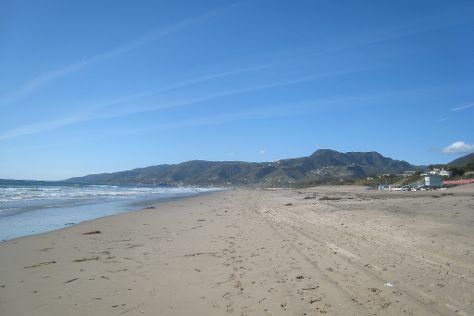 Known for its Mediterranean climate, a 21miles strip of the Malibu coast incorporated in 1991 into the City of Malibu. The area is known for being the home of Hollywood movie stars, people in the entertainment industry, and other affluent residents. Most Malibu residents live within a few hundred yards of Pacific Coast Highway (State Route 1), which traverses the city, with some residents living up to a mile away from the beach up narrow canyons. As of the 2010 census, the city population was 12,645.Signs around the city proclaim "21 miles of scenic beauty", referring to the incorporated city limits. The city updated the signs in 2017 from the historical adj=on27 length of the Malibu coast spanning from Tuna Canyon on the southeast to Point Mugu in Ventura County on the northwest. For many residents of the unincorporated canyon areas, Malibu has the closest commercial centers and they are included in the Malibu zip codes. The city is bounded by Topanga on the east, the Santa Monica Mountains (Agoura Hills, Calabasas, and Woodland Hills) to the north, the Pacific Ocean to the south, and Solromar in Ventura County to the west. Malibu is in California (CA). Our United States sightseeing planner combines visitor reviews with your personal interests to make an itinerary informed by experts, but tailored to suit your style.